Welcome family and friends! 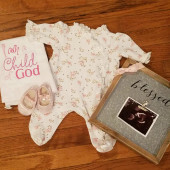 Thank you for visiting our baby registry! We hope you will be able to attend our baby shower on November 10th! A Special Note: Avery has been diagnosed with bilateral clubfoot. This condition is completely treatable, but will require her to be in casts and special boots and bar 23/7 for her first 5 months, then will transition to boots and bar only at nighttime. Her casts and boots will require special clothes and baby items. Avery will not be able to wear footie pajamas, but footless pajamas with snaps and gowns are perfect. She will need leg warmers to cover her casts, lots of onesies, turn-cuff socks, open leg swaddles, and Halo sleep sacks for safe sleeping. I have added these items to our registry for easy shopping! We can't wait for our sweet girl to be here! See you soon!